Below I have transcribed the citation given during the ceremony for Sir Dunstan St. Omer where he was presented with an honorary Doctorate degree by the University of the West Indies (U.W.I.) on October 18th., 2009 in Castries. 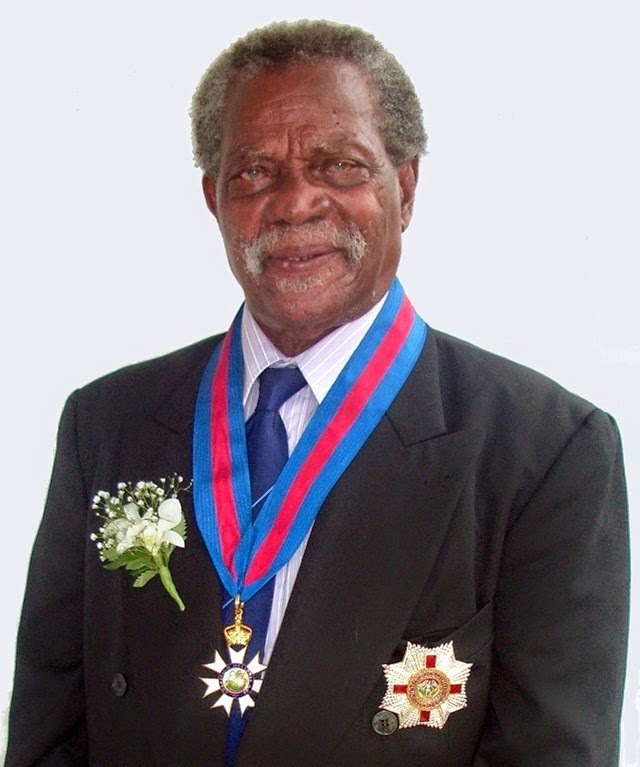 Born in Castries Saint Lucia in 1927 the Honourable Dunstan St. Omer attended the St Aloysius Roman Catholic Boy's School and Saint Mary's College. In 1946 he left St Lucia for Curacao and came under the influence of the Greek painter Pantelis. On his return he taught at the Vide Bouteille School and also at his alma mater Saint Mary's College. He also taught at the Extramural Department of the University of the West Indies from where he received a scholarship to study art in Puerto Rico. 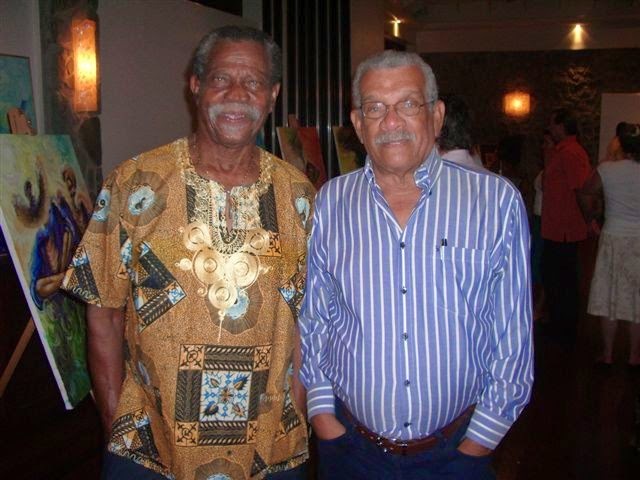 On his return to Saint Lucia Dunstan St. Omer, Derek Walcott his soul mate from childhood, and a few friends from childhood started the Saint Lucian Arts Guild. That in part became the regional movement to decolonize the artistic community, and to reflect the social reality of a people trying to carve out their own space and to build their own nations. He worked with The Voice newspaper as sub editor and subsequently as editor from 1959 - 1962. Then as Secretary to the Saint Lucia Chamber of Commerce from 1967 - 1971. His role according to the Swahili word 'mwalimu' or art teacher for schools was the anchoring feature of his career. This period spanned from 1971 until his retirement in 2000. He has been referred to as the father of the artistic genre called prism-ism where in seven geometric shapes he creates flat surfaces based on prisms using the colours red, yellow, and blue. 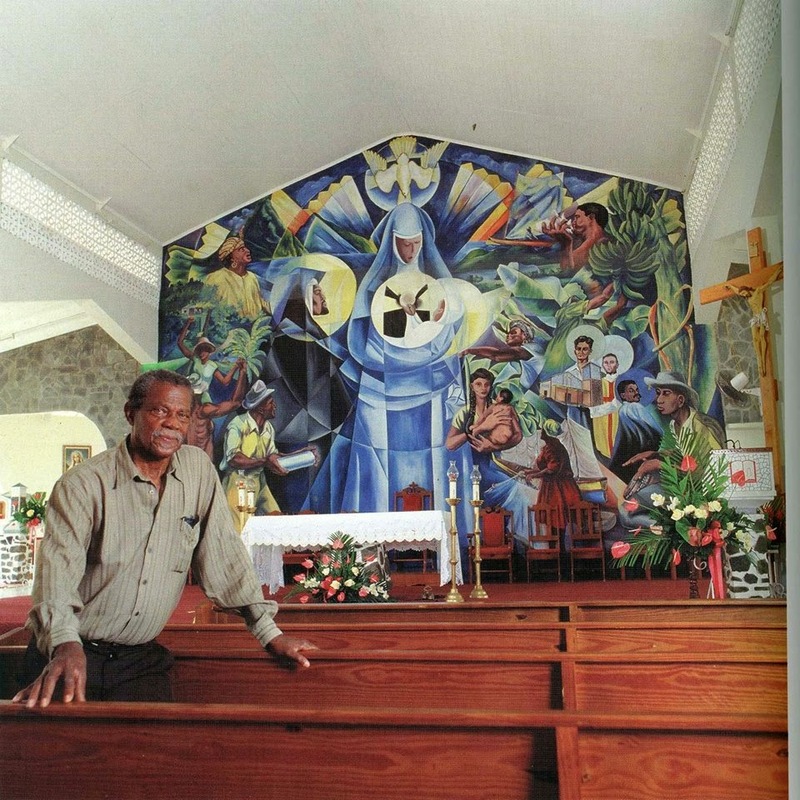 He is best known for his murals painted on the altars of several churches in Saint Lucia, the Saint Michael Church in Martinique, or the Church of St. John Vianney and the Uganda Martyrs at St. Benedict. Trinidad. Some of his outstanding works have been the Holy Family mural at the Church of the Holy Family in Roseau, the murals of the Basilica of the Immaculate Conception, the La Rose mural at the Rose de Lima Church in Monchy, and the Last Supper mural at the Church of the Holy Cross in Desruisseaux. St. Omer has always had a political engagement with his people. His art has always been one of defiance of the cultural epitome of Europe and a struggle for a local identity. At one point he said, "The curse of the Caribbean is that our poverty is picturesque. Our daily reality is regarded by Europeans as heaven on earth, but for centuries they denied us the real thing. Until I painted the mural in this church, the Roseau Valley Church, black people were not admitted to heaven; not even as waiters." His paintings of the black Christ and the black Madonna are symbols of hope for Saint Lucia and black people everywhere. His reading of blackness is uplifting, empowering, unique, generative, and rebellious. Some may argue that the ambiguity may lie in his deep and resolute belief in Christianity and his own checkered colonial past. But he has sought to resolve it almost as a form of manifest destiny or mission by attempting to save Christianity for his people. By highlighting the message of love and with its attributes of unity and essence to life mirrored in his painting. 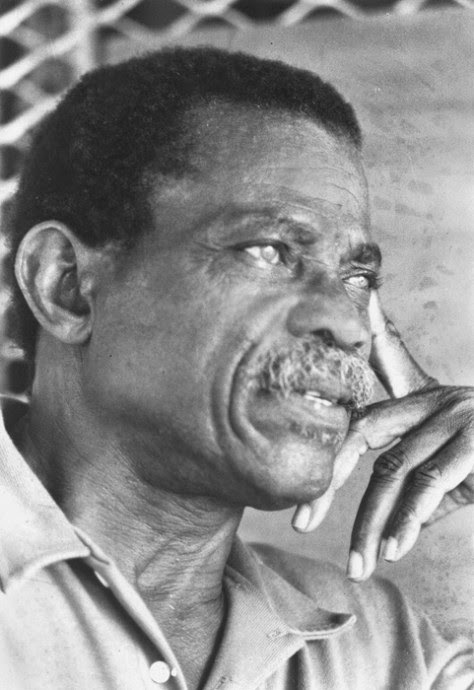 Dunstan St. Omer has sought to heal historic wounds and has offered us the possibility of renewal. By his work he points to an epiphany. 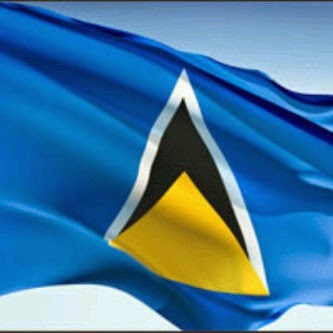 Dunstan St. Omer in designing the national flag has engaged in democratic art of the highest level. He has provided to society with an identity of himself. This identity reproduced over time and space taking to the world an image of this community. St. Omer's art titled 'Prometheus' graces an external wall at the U.W.I. open campus with his theme of man receiving from God the gift of fire and light reflective of the U.W.I. motto Oriens Ex Occidente Lux, a light rising from the west. Saint Lucians internationally acclaimed visual artist was awarded the Saint Lucia Cross by the government of Saint Lucia, and a Papal medal by the Roman Catholic Church in 2004. He was acclaimed a national hero by the Jubilee Trust Fund in collaboration with the Folk Research Center and the Cultural Development Foundation in 2007. 57 years who shouldered the responsibility of homemaking especially during the lean periods. 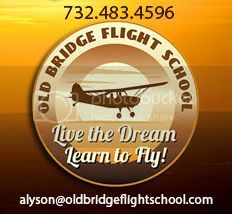 His 9 children , Alwin, Luigi, Giovanni, Julio, Roxanne, Sophia, Digna, Lygia, and Dunya; professionals in their own right with an international reach. Luigi incidentally gives us hope for continuity and sustainability. St. Omer, a little while after we had prepared this document, reminded me, with pride and satisfaction, of his first grandchild whom he raised and who now holds a Master's degree in Education from Harvard University. And at the root of it all, Saint Lucia, Saint Lucia, la belle Helen and its people whom he loves dearly. Chancellor you will agree, I assure you, that Dunstan St. Omer is fully deserving. "NOTHING MATTERS BUT TO BE A SIGNIFICANT BLACK MAN"
One of St. Lucia's greatest sons and the Caribbean's great cultural Icons sailed into the sunset today, Hon Sir Dunstan St. Omer PHD, our dad. Husband of Lady Cynthia St. Omer and father to Roxanne, Lygia, Sophia, Alwyn, Luigi, Digna, Julio, Giovanni and Dunya, his nine children, twenty one grand children and five great grands. Not many individuals in our life time have had such a profound influence on so many lives and was more passionate about his country, his faith and his family like our dad. His entire existence was in service of his people and their upliftment, CARICOM named him one of the hundred most influential West Indians of the past Century. Hailed by Nobel Laureates, Professors, Prime Ministers, The Vatican, the International Press and Artisans the World over as a genius of his time, a very special breed of human being, an amazing father, devoted husband, loving grandfather, and most loyal subject to the people of his beloved St. Lucia. 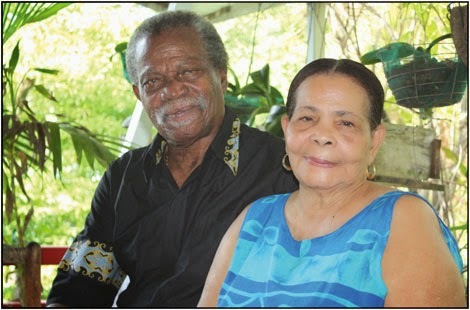 Born 24th October 1927, the second son of Gerald and Louisa St. Omer, his father an ex soldier and customs officer and his mom a home maker, an older brother Allen and younger sister Geraldine. In 1952 he married his sweetheart Cynthia St. Croix, today Lady Cynthia St. Omer, a marriage that spanned 63 years to this day. Sir Dunstan a devoted Catholic with a great passion for the Virgin Mary and the fetal relationship of the mother and child had become his trade mark. Our father always said that his greatest contribution is being able to paint Christ, Mary Mother and Joseph as black, "Your God must be of you and you of your God". A major player in the seventies black consciousness and Art movement, he carved a regional following that transformed the thinking of young Artist paving the way for a generation free in their creativity. " The curse of the Caribbean is that our poverty is picturesque", Sir Dunstan had a way with words and those he touched were the better for it. "But, ah Gregorias, I christened you with that Greek name because it echoes the blessed thunders of the surf, because you painted our first frescoes, because it sounds explosive, a black Greek's, a sun that stands back from the fire of itself, not shamed, prizing its shadow, watching it blaze!" (From "Another Life" by his boyhood and long time friend Hon Derek Walcott). 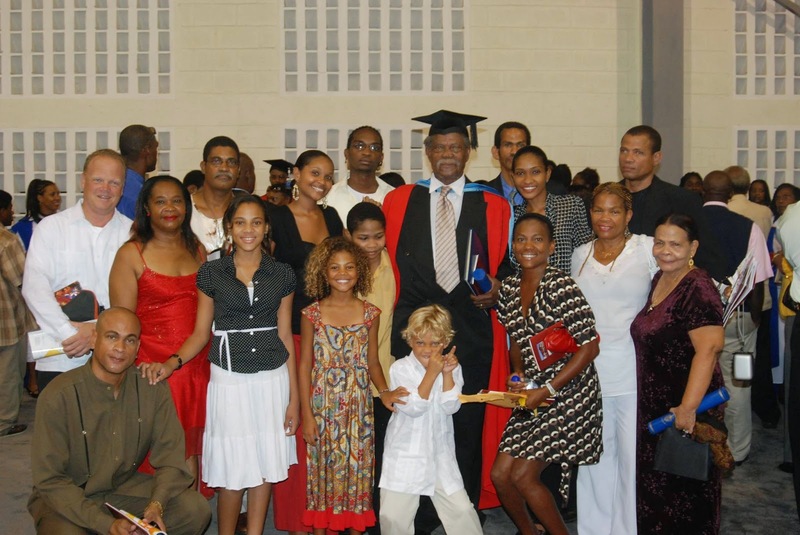 We love you daddy, not just your wife and kids but all of St. Lucia, our flag is the monument every St. Lucian will hold dear in your honour and memory. "Do not go gentle into the night, Rage, Rage, against the dying light"